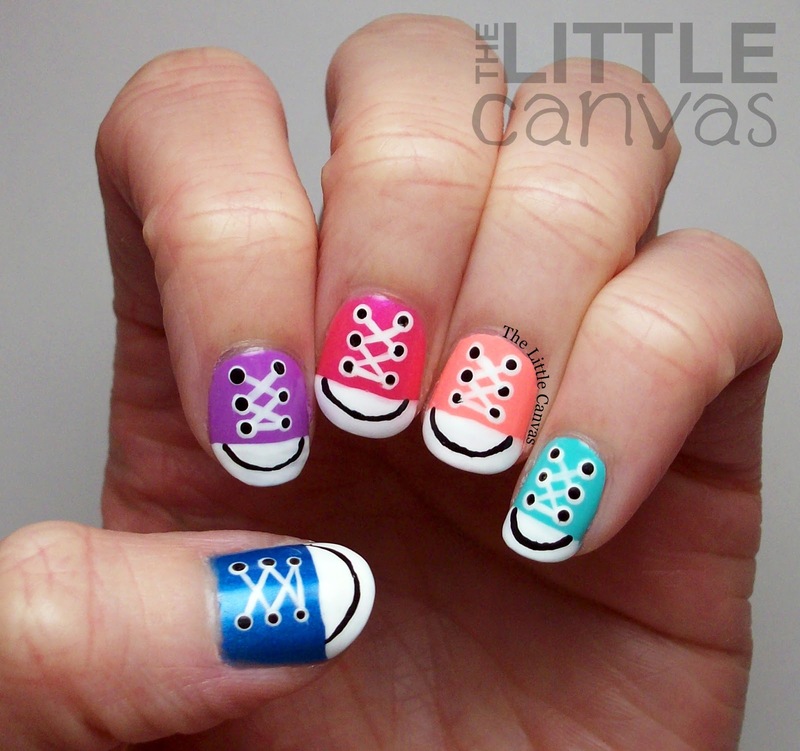 Converse Nail Art Take 2 + Tutorial! Hello polished world! Happy Saturday! As I write this post, I'm not a happy camper about my current manicure which is going up on the blog later this week. If I have time this weekend I most likely will re-do it. It got super hot here all of a sudden, and with that all the formulas on my polish I swear changed and it's frustrating me. Maybe it's mind over matter, but I swear it's the humidity. So, to make myself happy, I am sharing one of my all time favorite manicures that I have re-created. 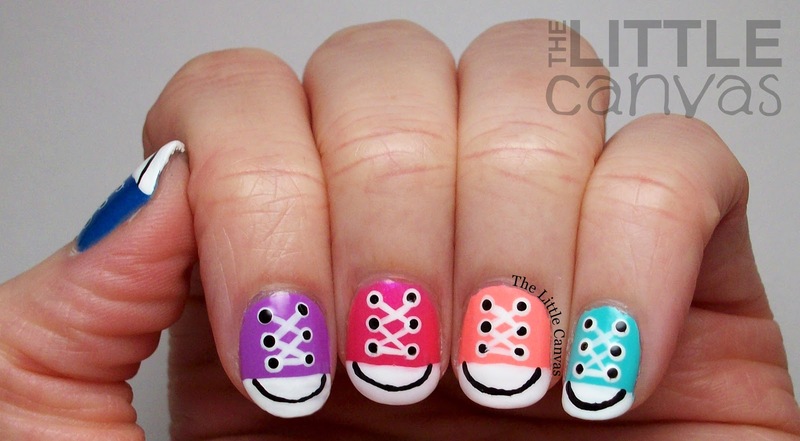 This manicure being the converse nails! 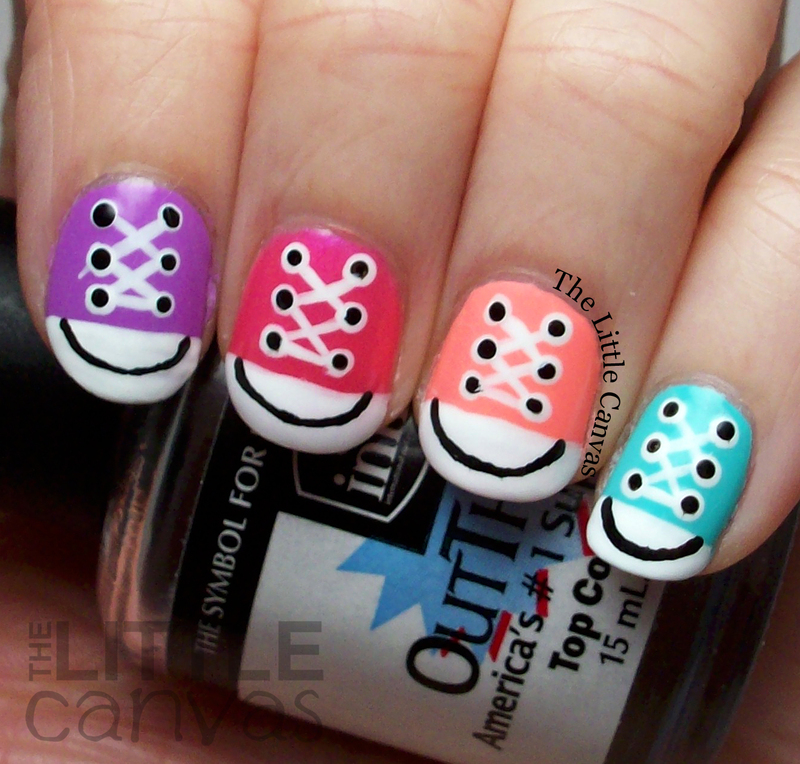 I originally did converse nails when I first started blogging. To this day, it's one of my most popular posts, and the pictures are unfortunately the most stolen. Due to it's popularity, I really wanted to re-create the design and see how my skills have improved. Then maybe people could start sharing a better version of the ones that are kind of a huge mess. Earlier this year (literally I think I did these in February or March), I finally got around to doing the design. Due to other things going on with the blog, they were put in the drafts folder and kind of forgotten about, until now! Plus it's perfect since now that it's warmer I'm living in my Converse. Tutorial Time! 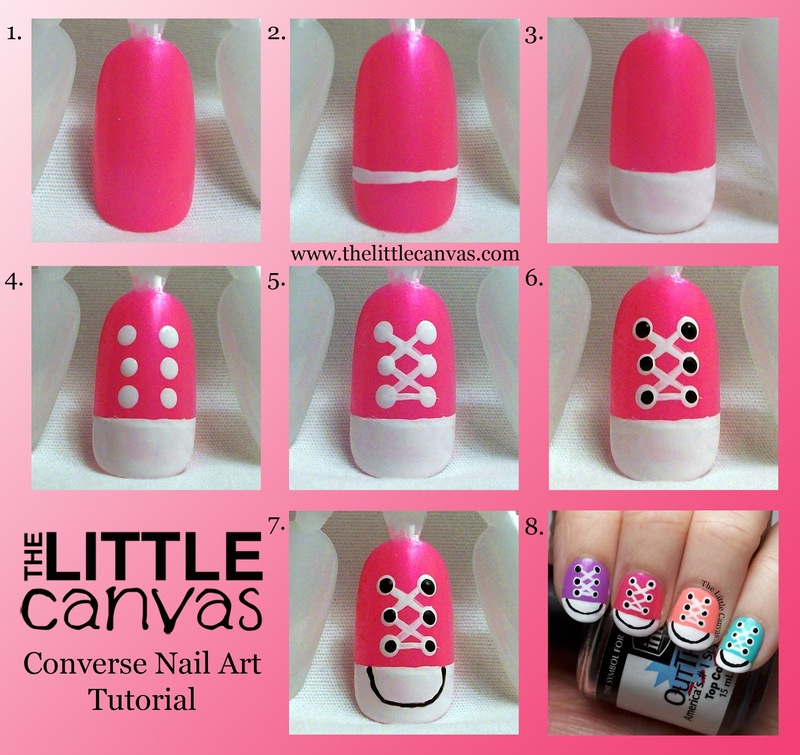 At the time I did this post, this was my first tutorial using the nail art wheel. I think I've gotten a little better creating them since this! Start off with a base coat of your favorite neon polish. For this tutorial, I used Orly Oh Cabana Boy. 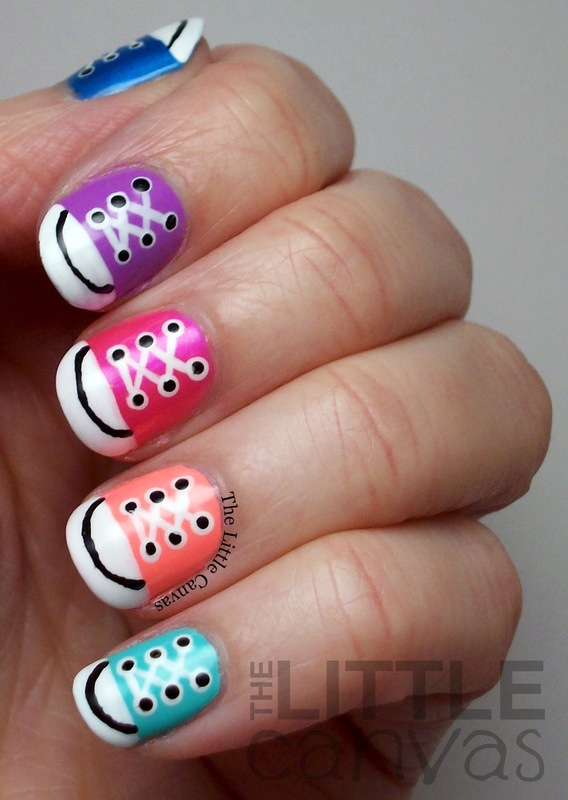 You could also use a black polish for a traditional Converse look. With a white striper, create a white line across the nail. Fill in the tip of your nail with a white polish. With a dotting tool, create six dots on the nail for the shoe's eyelets. With the white striper, create the laces. After the laces are drawn in, with a dotting tool, create the black dots in the eyelets. With a black striper, create the black U on the shoe's toe. Finish off with a top coat and enjoy! These make me so happy. I love my Converse and I really wish I had a pair in all these colors. Especially that mint on my pinkie finger. It would make me so happy, especially since I'm mint obsessed lately. I noticed on Converse's website that you can create your own Chuck's now and I might have to do that for my birthday. If I do, you can bet your booty that I'll create a manicure to match them. What do you think? Better than the first attempt? Will you re-create the look? As a reminder, if you are going to share my image, please do NOT remove my cuticle watermark. I work hard on my nails and this blog, and it is upsetting when I see my nails appearing on other people's Instagram accounts with no credit, or my favorite 'Look at my nails" caption. Myself, along with other bloggers, put a lot of time into our sites...it truly is a labor of love. So please, give credit where credit is due. Twinsie Tuesday: Re-visit a Prompt! Piggy Paint Tape Manicure! and Giveaway!